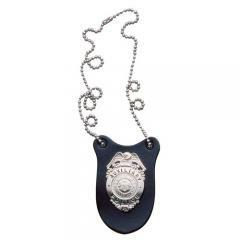 The Knighthawk U12 Neck Badge Holder from DeSantis is a convenient way to carry a duty badge at all times while on the job. The simple metal neck chain allows it to be tucked away discreetly inside a shirt or jacket, perfect for off-duty wear or use during covert operations. The U12 accommodates a variety of different-shaped badges with rear pin closures. The premium holder is made from tough black leather with a smooth plain finish, guaranteeing lasting service life and a professional appearance that compliments any department's uniform standards.